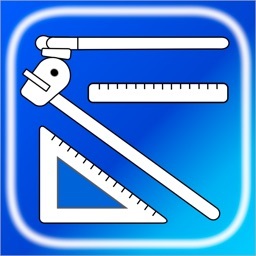 RIGIDpro is an advanced bending calculator that was specifically made for helping with Mechanical, Electrical, and Hydraulic Benders. A true respectable side kick to any electrician working with conduit of any type and size. 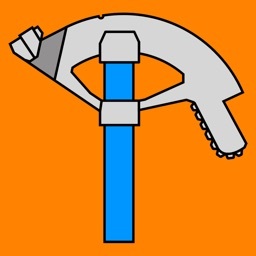 Whether you need to swiftly obtain information about the bender you’re using, or a multiplier card without scrounging through your wallet, or a calculator with the capability of working with fractions (x/16”) and decimals simultaneously, or a bender calculator that accounts for gain and shrink. 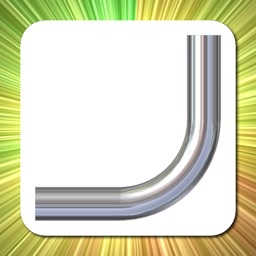 Allowing you to layout multiple bends on a single conduit quickly. RIGIDpro is your answer. RIGIDpro is broken into 5 different categories. Select Bender: Create, load, and delete benders of various types. Select from several different types of bender styles whether it’s a Mechanical, Electrical, or Hydraulic Bender. All Benders are programmed with the Centerline Radius and Take-Up of the shoe that are based on their factory settings found within their manuals (accuracy may vary slightly). Shoe Specs: Edit and view the information about the selected bender. 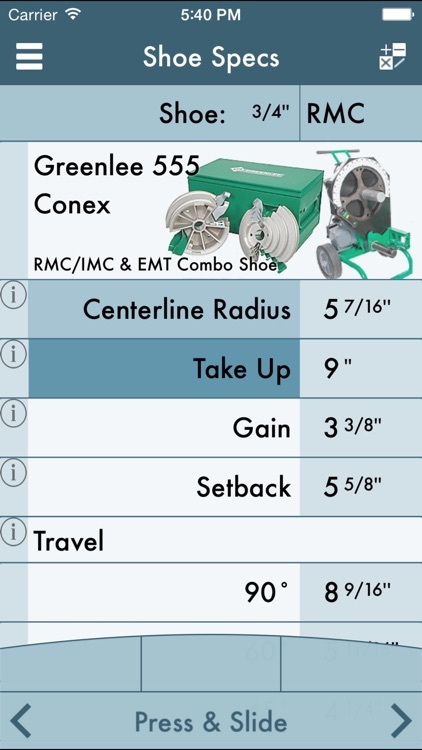 With a simple click and drag you can change the Centerline Radius (this information can usually be found on the bender’s shoe) or the Take-Up of the specific shoe size being used. Quickly discover additional information about the specified bender’s shoe such as the Gain, Setback, Travel and Radius Adjustment. Mark Conduit: Have a complicated bend? 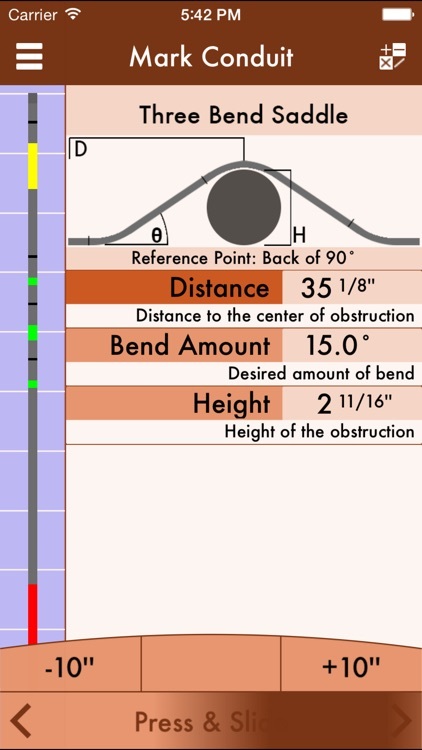 Say a 25” stub, a Three Bend Saddle that needs to be centered 35” from the Back of that 90 at a 22.5 degree interval and needs to clear a 4” conduit, with another 90 66 ½” inches away from the back of the previous 90, and it needs to be cut 25” from the back of that 90. Not only that, but you don’t have the luxury of having a pony handy and you only have a table threader. No problem. The advanced bending calculator of RIGIDpro can handle anything you throw at it. 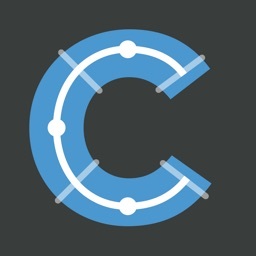 With additional features that allow you to change the conduit size and type; Mark to Center, which deciphers between placing marks at the tip of the hook or the center of the bend; Measure To Center, which will align all bends to the center of conduits, ideal for running raceways with various sizes of conduit. 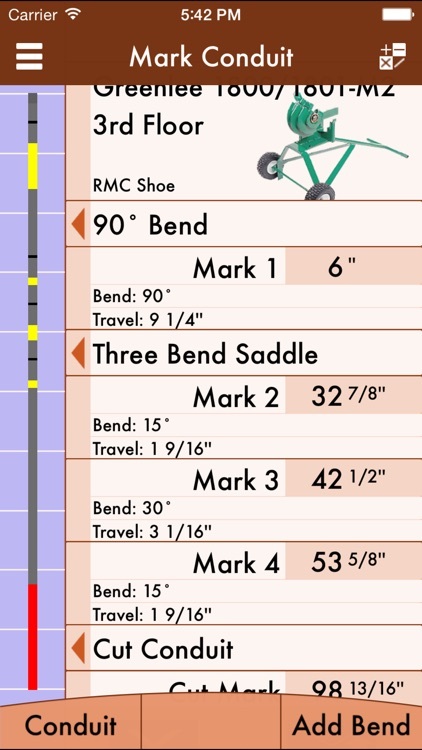 There is the ability to go and edit specific bend measurements; if you wanted the first 25” 90 stub to be 27” without changing the distance afterwards. 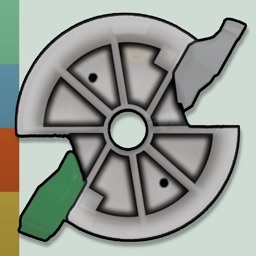 Also if you have a ground-man and they don’t have the app? RIGIDpro can send them a text with all of the information detailed within the message with a click of the button (make sure it’s okay with them before sending any text messages, all normal rates will apply.). Bends supported are 90 Bends, Offsets, Three Bend Saddle, Four Bend Saddle, Kick with 90 Bends, Kicks, Segmented 90 (3 – 49 shots), and Cut Conduit. With more bends to soon come these bends may be added into whatever sequence you can cleverly come up with. All marks and measurements are based on the push-trough method, from first to last and the Centerline Radius. 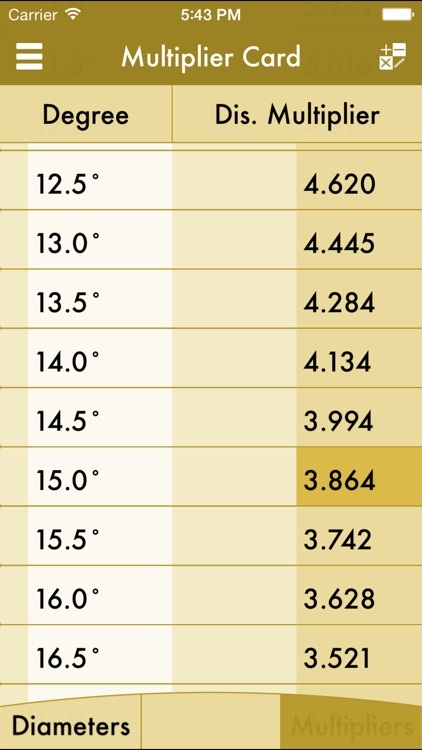 Multiplier Card: Quickly reference the distance multipliers and shrink constants from 0.5 degree - 90 degrees. Also view the Outside, Inside, and Knock-Out Diameters from ½” – 6” conduit of all types. 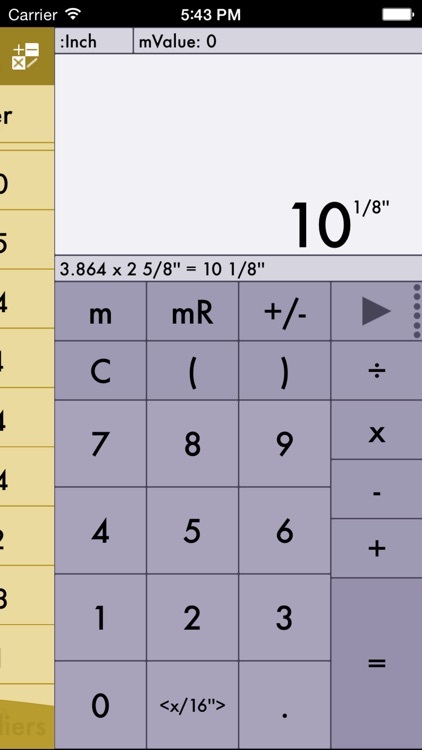 Calculator: Simple, yet sophisticated. It contains functions such as addition, subtraction, multiplication, and division. Also includes the ability to store and recall memory, squaring, and calculating the square root. The calculator gives you the ability to quickly transpose from Fraction:Decimal and Decimal:Fraction. Easily mixing formulas such as 2.61 x 3 ¼”. If you have any suggestions, or notice any bugs please e-mail me [email protected] I’ll do my best to accommodate to everyone. 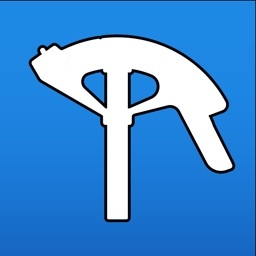 Hand-Benders are not supported with this app -- only Mechanical, Electrical and Hydraulic. There will be more benders make/models added in the future.